We are closely aligned with 2 other Bujinkan Schools in South East Qld under the umbrella name of SANSHIN DOJOs. Raymond, Dean and myself train together, run our school syllabus very similar and travel to Japan together with some of our students. Our Hokkaido Wolves Self Defence training combines the traditional values and discipline of Ninjutsu with the knowledge and awareness of today’s issues that our children face, including “bullying” and violence in society. Our Hokkaido Wolves learn self defence, stranger awareness, fitness, self discipline, self respect, confidence, anti-bully awareness, flexibility and co-ordination. At Shinkan Dojo’s we concentrate on the basics which is the Kihon Happo and Sanshin no Kata. The ” Kihon Happo ” can be translated as ” Basic Eight Ways ” and forms the core of the Bujinkan Budo Taijutsu hand to hand fighting system. The Kihon Happo is the basis of all Taijutsu, but also that these eight techniques are really just the beginning. 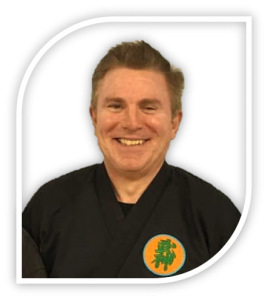 Raymond Parker has studied several martial arts over a period of 30 years including Shotokan Karate, Shorinjiryu Karate, Jujutsu, Aikido and Bujinkan Budo Taijutsu. 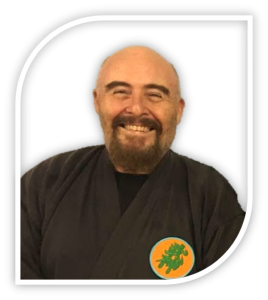 He was graded to 5th Dan Black Belt in 2014 and awarded his Shidoshi (Instructor) rank at the same time. 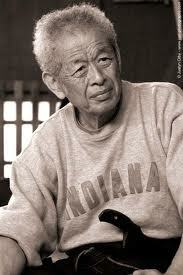 Raymond travels to Japan regularly to train with Hatsumi-sensei and the senior teachers of the Bujinkan, including Nagato-sensei, Noguchi-sensei, Seno-sensei, Someya-sensei and Shiraishi-sensei. 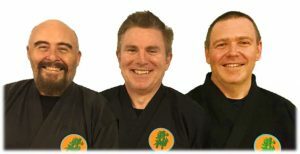 We are directily linked with the Bujinkan Dojo Japan as Licienced Instructors.